They say that more people are born in the months of October to December because of weddings happening in the colder months and well, Valentines. 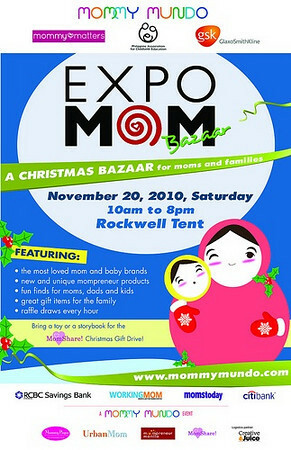 And the Expo Mom could very well be the perfect bazaar to go to for your wifey's push presents. Perk them up from their post-partum blues by letting them shop for great nursing wear or matching outfits for your brood. Here's a list of the vendors at the Expo. Entrance fee is P25 which goes to Mommy Mundo's MomShare charity. Also, bring a toy or storybook to donate to their MomShare cause as well.